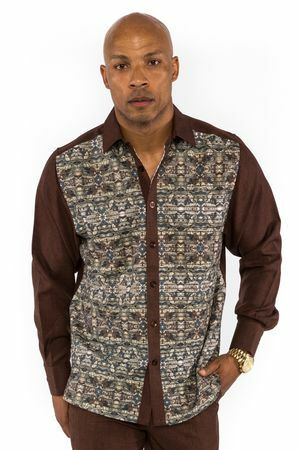 If wearing the most stylish fashion menswear is important to you, Prestige is a great choice to consider. Prestige is a designer brand that takes style up to a whole new level because they are designed in Italy and are made of fine fabrics and finish details. This brown rayon walking suit features a classy and unique floral pattern front with flat front style pants made of a silky feeling 100% Rayon fabric. Once you try Prestige brand fashion walking suits and menswear, you will know that these are simply the best.